Online Kanban boards are one of the most efficient electronic applications for improving team productivity and visual project management. They are used with success in large, medium and small businesses all around the world. Why do companies decide to implement Kanban? It's obvious. None of the existing time, task or project management methods are both user-friendly and efficient at the same time. Also, it's been proven, that implementing Agile methods - such as Kanban - significantly improves projects success rates. An online Kanban board is a web-based Kanban software, supporting you in managing tasks and projects with colorful sticky notes moved about a virtual Kanban board. It lets you use your own computer screen to visualize, control and optimize workflow and collaborate with other team members in real-time. A unique characteristic of an electronic Kanban board is the opportunity to track and analyze work with the built-in metrics. 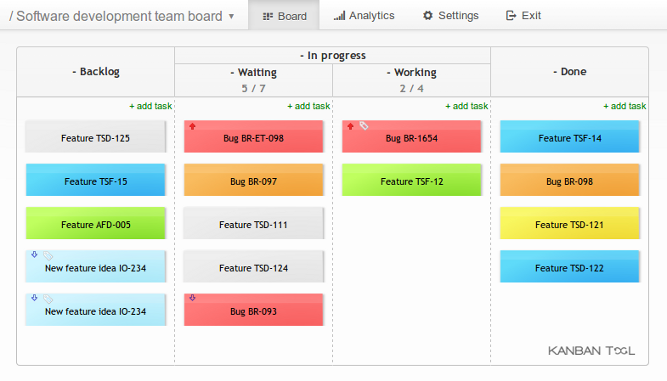 Web-based Kanban boards can be easily customized to map any kind of workflow. You can change names and sizes of columns, define own card types and adjust the Kanban card template to your needs. 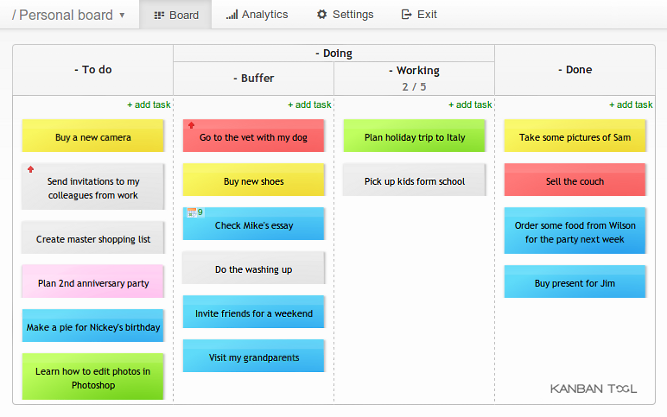 There are many types of online Kanban boards and each works best in specific use case scenarios. A basic personal electronic Kanban board consists of three columns: To Do, Doing, Done. Such workflow is the best approach for individuals and small teams. Tasks are created in the leftmost column and are being moved towards the right. The work is finished when all tasks reach the final column. If you like to plan ahead, then the time driven workflow is the best fit for you. Time driven workflow is divided into: To-do / Future, This week, Tomorrow, Doing / In Progress and Done columns. Doubtlessly, it can be used instead of your traditional calendar. The most popular example of a Kanban board for Agile or Lean software development can consists of: Backlog, Ready, Coding, Testing, Approval and Done columns, with many a variation possible.